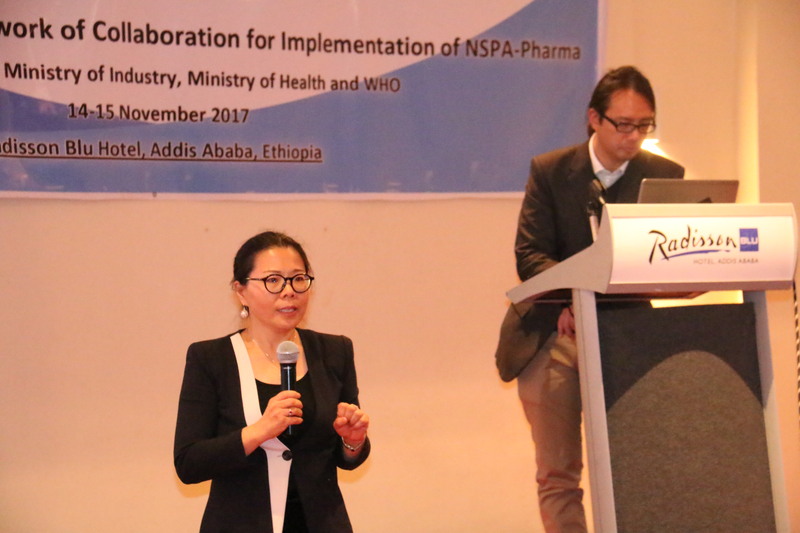 14 November 2017, Addis Ababa: A meeting on an interagency framework of collaboration for implementation of the National Strategy and Plan of Action for Pharmaceutical Manufacturing Development in Ethiopia (NSPA-Pharma) was conducted in Addis Ababa from 14-15 November, 2017. 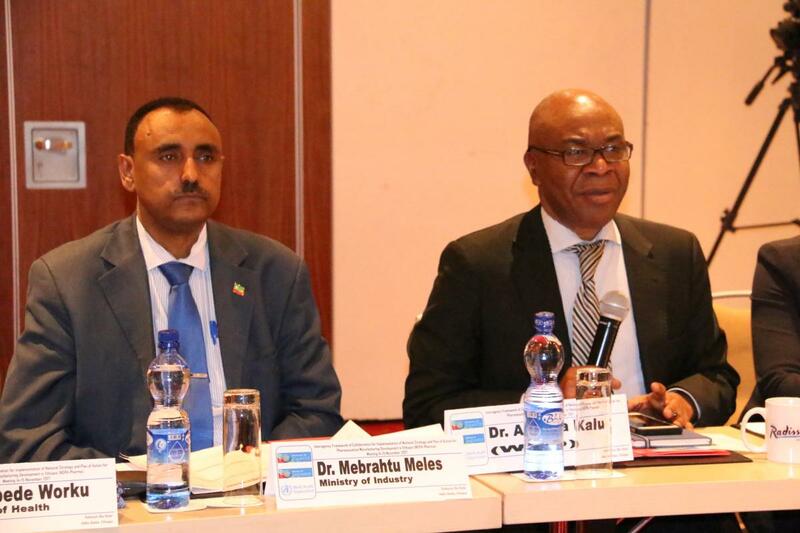 The meeting was co-organized by WHO in collaboration with the Ministry of Industry and Ministry of Health and attended by various national & international organizations including UN agencies, international development partners, Ministry of Industry, Ministry of Health Ethiopia and other stakeholders working in the area. The objectives of this meeting were to share partners’ expertise and activities in local production; to discuss an interagency framework for collaboration for the implementation of the NSPA Pharma; share the three-year Plan of Action and further strengthen collaboration and coordination in implementation. H.E. 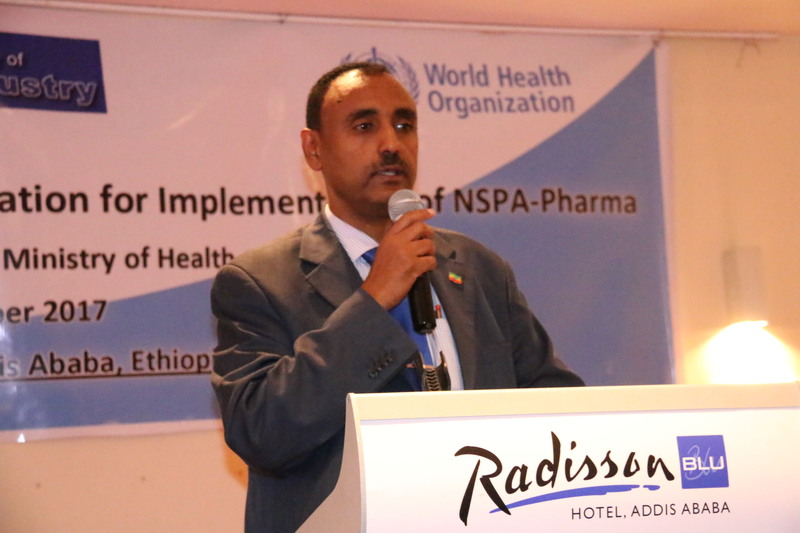 further expressed his gratitude to the participants for taking part in this important meeting that would help to establish an effective partnership which enables the Government of Ethiopia to achieve the targets and goals of the NSPA-Pharma. He also appreciated the tremendous support offered by WHO and partners throughout the development and implementation so far and aspired this commitment to continue. Presentations were made by the NSPA-Pharma Project Secretariat on the revised NSPA-Pharma plan of action and the partners (AUC, UNAIDS, UNCTAD, UNICEF, UNIDO, WHO-HQ, Global Fund, TBIGC, GIZ, USAID, USP and USP/PQM) on their respective work in local production. WHO-HQ also presented the draft inter-agency framework of collaboration, followed by a discussion on the draft framework which was moderated by H.E. Dr Mebrahtu Meles, State Minister of Industry. The draft interagency framework of collaboration aims to enable the Government of Ethiopia to achieve the targets and goals of the NSPA-Pharma to improve access to quality, efficacious and safe locally-produced medical products . Dr Jicui Dong, Programme Manager for Local Production, Regulatory Systems Strengthening (RSS), Regulation of Medicines and other Health Technologies (RHT), Department of Essential Medicines and Health Products (EMP) from WHO-Head Quarter (HQ), during her presentation on WHO’s work in local production, highlighted that the inter-agency framework of collaboration aims to assist Ethiopia in implementing the NSPA-Pharma by leveraging on partners’ expertise and advantages and improving coordination and collaboration. There was active discussion and recommendations and next steps were proposed. The meeting ended successfully, having met all of its objectives, with closing remarks from Dr Kalu. It has already been two years since the Government of Ethiopia started the implementation of this ten year national strategy and five year action plan. Ensuring access to safe, effective and affordable essential medicines and vaccines for all and promoting industrialization and gross domestic product are part of the goals of SDGs which are specifically related to this meeting agenda.